• 14” Diameter Base Flange, 8" Inside Diameter, 6" Stack Height. Universal design easily accomodates one to four penetrations in one watertight unit. The 6" base height enables flashing in to most roofing systems. 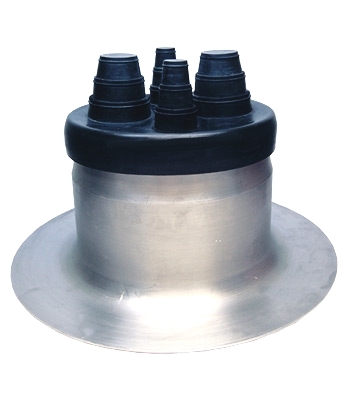 Consists of a flexible EPDM cap w/Stainless clamps and a one-piece, spun aluminum 14" diameter 6" high base. The flexible EPDM cap eliminates roof leaks because penetrations can expand, contract, and vibrate independently of the roofing system. The EPDM cap seals to the aluminum base by a interlocking weathertight seal. UNIVERSAL UNI-BOOT COMMERCIAL 1-PIPE FLASHING. 14 INCH DIAMETER SPUN ALUMINUM BASE, 8 INCH ID, WITH EPDM RUBBER CAP, 1-FEEDTHROUGH. FITS PIPE OPTIONS OF 3-7 INCHES. PRICE/EACH. Universal 4-Pipe Flashing Cap / Boot (fits onto a 8-inch spun aluminum base, not included). EPDM cap has 4-feedthroughs. Fits pipe sizes of 1/4, 3/8, 1/2, 3/4, 1, 1-1/2 or 2 inch. Price/Each. Portals Plus #29430 5-Pipe Portal Kit. Includes #29285 14x14 inch Curb Cover, 5 each #C-555 Black Pipe Caps, 5 Stainless Steel Snap-Lock Clamps. Fits 5 Pipes 0.5 to 2.5 inches. Price/Kit. (special order; shipping leadtime 1-3 days).